The elves of PickAxis have been hard at work over this past holiday season, most recently setting out to judge the entries for the Winter Wonderland build contest. There were quite a few awesome builds, and the elves have selected their new home for the next year! First Place SCNickNamer $50 store credit & 500 tokens Second Place Bird $30 store credit & 450 tokens Third Place NEKOMENACE2 $20 store credit & 400 tokens Honorable Mention gsdcs29615 300 tokens Honorable Mention 9monkeys 300 tokens And finally, all entrants who finalized their plots with /plot done will receive 100 tokens. Thanks to everyone who took part in building and visiting our own little winter wonderland! Keep an eye out for our next build contest! Well, it would seem that the ghouls and goblins of the nether have gone back to their dark places. Left in their wake were some otherworldly builds. A now, the results of the first PickAxis build contest! First Place $50 store credit & 500 tokens UltimateStuff & ninjabou /warp firstplace Second Place $30 store credit & 450 tokens OrangeyApples /warp secondplace Third Place $20 store credit & 400 tokens nick_godoy /warp thirdplace While we were only able to award 1st through 3rd places, there were some entries that are worth an honorable mention. Each will receive 350 tokens! Honorable Mention skarzs /warp honor1 Honorable Mention NEKOMENACE2 /warp honor2 Honorable Mention lnpejc /warp honor3 Honorable Mention Xx_Gonder_xX /warp honor4 And finally, all entrants that finalized their plots with /plot done will receive 100 tokens!  The PickAxis store will soon be online and the winners' prizes will be credited to their accounts. Thank you to all the entrants. They were all great builds and we really enjoyed exploring and discovering the secrets you built into them. Stay tuned for the next contest! The lifeforms of PickAxis have been out searching for new inhabitable areas of the galaxy. Throughout their journey, they've found quite a few planets, ships, and other creations from some very talented builders. After quite a bit of consideration, they've tabulated the data on which creations might be of use to them. First Place IntenseMoose $50 store credit & 500 tokens Second Place skarzs $30 store credit & 450 tokens Third Place KingPoutine $20 store credit & 400 tokens Honorable Mention JinxOne 300 tokens Honorable Mention steeleman345 300 tokens Honorable Mention turtle90 300 tokens And finally, all entrants who finalized their plots with /plot done will receive 100 tokens. Thanks to everyone who took part in creating and exploring our own little galaxy! Keep an eye out for our next build contest! Interested in peering into space? Check out Google Sky and begin exploring what's out there! Video Games Build Contest Winners! The levels have all been completed and all your base are belong to us! After many rounds of collecting loot and leveling up our weapons, the winners of the Video Games Build Contest have been chosen. First Place Brobe40 50 Coins & 500 tokens Second Place Snowball731 & pyrolily 30 Coins & 450 tokens Third Place ZTolerance 20 Coins & 400 tokens Honorable Mention Best Throwback RoryTheRoman94 300 tokens Honorable Mention Best Pixel Art Wrena 300 tokens And finally, all participants who finalized their plots with /plot done will receive 100 tokens. Thanks to everyone who took part in creating some epic builds for this contest! Now go outside, ride some rides, and get ready for the next build contest. Heroes & Villains Build Contest Winners! The Heroes and Villains of PickAxis City spent some time building their lairs and hideouts but have since resumed their epic battles. Our judges have moved in to see how many new residents PickAxis City has. Here are the results of the PickAxis Heroes and Villains build contest! First Place $50 store credit & 500 tokens Jinx (sgJinx98) (Hero) /warp firstplace Second Place $30 store credit & 450 tokens Snowdrift128 (Hero) /warp secondplace Third Place $20 store credit & 400 tokens SCNickNamer (Villain) /warp thirdplace Honorable Mention 350 tokens NEKOMENACE2 (Villain) /warp honorablemention And finally, all entrants that finalized their plots with /plot done will receive 100 tokens! The PickAxis store will soon be online and the winners' prizes will be credited to their accounts. Thank you to all the entrants. There were many great builds and we enjoyed seeing all the creative and epic hideouts. Keep an eye out for the next contest!